Dental implants from FirstBite Dental can be placed and restore one or more teeth in your mouth. They are placed into the gum and jawbone of your mouth, and offer a permanent fixed solution to enhance your smile and function, with a high success rate. A dental implant is a titanium post that is inserted into the bone. A crown can then be constructed to attach to the implant to replace the missing tooth. Dental Implants are proving to be a very effective way of replacing teeth as they are free standing and do not require other teeth to support them. When implants were originally invented, 4–6 months of healing was required for the implant to fuse to bone, before a porcelain crown could be attached to it. With today’s newest technologies, in some situations a crown can be placed immediately. We have the latest in 3D technology to help us determine what is the best type of implant for you. This gives us better accuracy and has revolutionised the way implants are placed. Latest research is showing the long-term success of implants after 10 years is approximately 90%. But the porcelain crown attached to the implant may have to be reviewed for replacement over it’s lifetime. Dental implants provide a long-term solution. Dental implants slow down bone loss and preserve nearby healthy tooth tissue. Dental implants look and feel similar to natural teeth. Dental implants will not decay. Dental implants can replace one or a series of lost teeth. Teeth implants are strong and able to perform the same functions as natural teeth. Teeth implants improve confidence and quality of life. Teeth implants greatly enhance functions, such as chewing and biting. 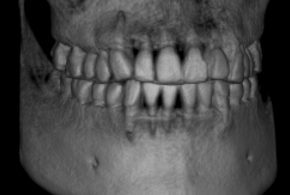 See examples of dental implants in our case studies section. Find out more about Dental Bridges.